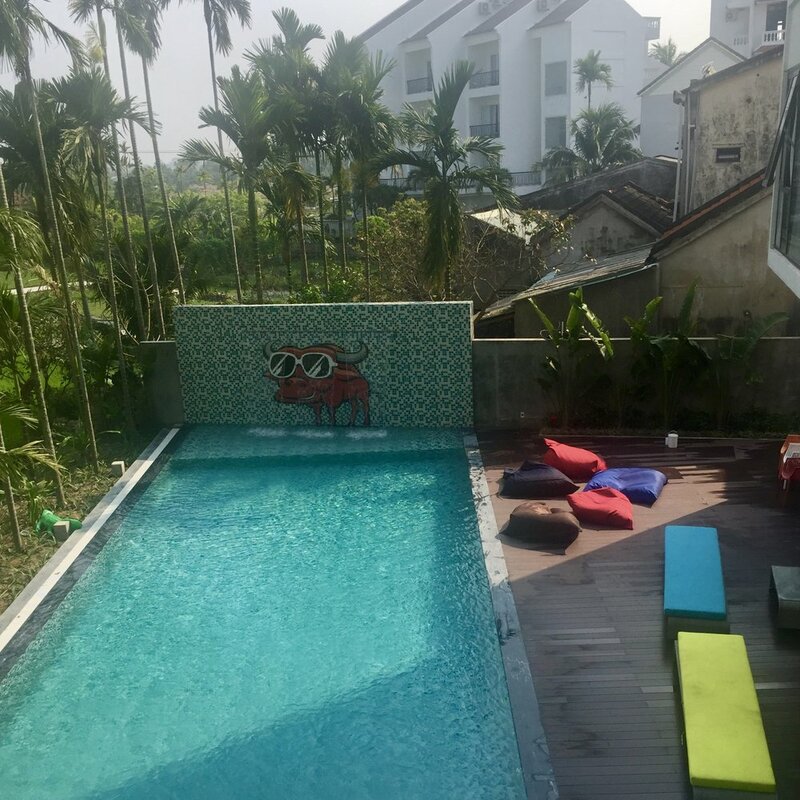 As you can imagine, this hostel attracts a very young crowd, but, with several room options to choose from (ranging from dorm bunks to private en-suites), there is something to fit every travellers style and budget. It should be noted that when I stayed at this hostel in March 2017, it was literally brand new. This can be a really good thing or a very bad thing. For this place, it was both... but let's start with the good. + The property. Was. Dopeeee. Because this hostel had just opened, everything was new (and clean). The rooms, bathrooms, pool area, and common spaces (including the bar/restaurant area and lobby) were absolutely immaculate. There are several common spaces in the hostel perfect for mingling with new friends, or plugging in to get some work done. + They served up a delicious, healthy breakfast every morning. As there was a big party crowd staying here at the time, early morning breakfasts were basically deserted (meaning I had the pool area pretty much to myself). + They had organized excursions practically every day of the week. I made it out for the bamboo boating which was a lot of fun. We biked to the location, were all given a non-la, and then rode through the groves in our little, circular bamboo boats. The guys who navigate these things are seriously skilled, and put on a bit of a show spinning the boats around at break-neck speeds. It was pretty impressive... but, if you're in the boat with them, prepare to get soaked. At the end of the boating, we played a traditional Vietnamese game that's similar to smashing a piñata, but much more intense. In this game, you swing a metal rod at a dangling piece of pottery... while blindfolded... as your friends try to scream directional words at you... and everyone else screams and makes noise to drown them out. It had a really fight-club(y) vibe to it... (never actually seen all of Fight Club, but I can imagine). Let it be known, that by some crazy stroke of luck, I was actually the first and only one to smash the pot. This is shocking because I'm normally very uncoordinated. They gave me a sprite, and I got to sit in what I guess was the "winners" chair by an adorable old, Vietnamese lady who was literally beaming at me. If you can make it for this activity, I'd highly recommend it. + They have a REALLY nice bar and pool area... With daily happy hour. This bit explains itself, really. Of all the places I met people during my backpacking trip, I found the best people here... and still keep in touch with a lot of them. The vibes here are SO positive, and everyone was really social and easy to get along with. They had their second ever pool party during my stay... and lets just say, I drank many a-mojito. Though I didn't personally have any negative experiences during my stay, I can't truthfully say the same for my friends. -Double Booking. One of my friends had booked a bunk, left her things there while she went out, and when she returned, found someone else's things there. They gave her another bed, but it was still a bit inconvenient and off-putting. (You'd think they would have reassigned the girl who got there second... but whatever... everything got sorted, so it was fine). -Organization... or lack thereof. The same friend who experienced the double bunk booking had every travellers worst nightmare come true as she was checking out. They had misplaced her passport. At the time, their organizational method involved putting a number sticker on your passport and then putting it in a drawer. Hers had somehow fallen behind the drawer. Thankfully, it wasn't lost, but it did result in her nearly missing her flight. Hopefully they've come up with a better system for storing people's passports... or stopped holding on to them altogether. -Constant Partying of Some Sort. The party scene at this hostel wasn't really a negative thing for me, but it may not be your thing. I didn't feel like I HAD to go out or join in on the festivities every night, but if you're easily peer pressured, you might. Those are really the ONLY "bad" things I have to say about this place... and I'd imagine that, at this point, these administrative issues have been sorted out. Overall, if you're visiting the lantern lit, tailor shop filled, city of Hoi An, the Vietnam Backpacker Hostel is an awesome place to stay. It's clean, safe, fun, in a great location, (and won't break the bank). If you're experience is anything like mine, you'll meet a lot of people, and you'll never be bored. At the Vietnam Backpackers Hostel, you've got options... you can either enjoy a lazy at the pool, rent a bike and explore the town and the beach on your own, or join one of the many activites organized by the hostel. To book your stay at Vietnam Backpacker Hostel, click here! When you book using my affiliate links, I receive a small commission that goes towards the cost of this webpage... (and, lets be honest... future travel). Be sure to check out their other locations in Hanoi, Hue, and Ninhvana!